Forbes just released its list of the world's most paid musicians in 2016, and several country stars made the list of the top 30. Most artists had huge tours and recent album releases to thank for bringing in the big bucks. And others are just downright good business owners. Like Toby Keith, for example. 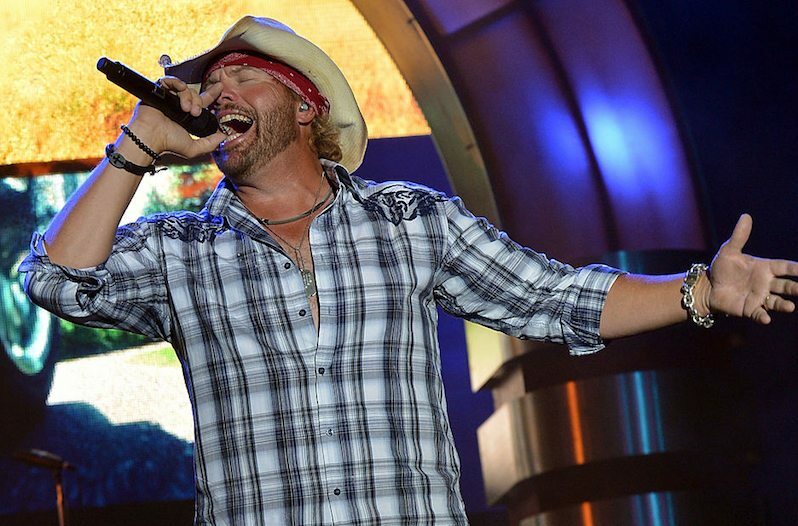 Toby Keith maintains his place near the top thanks to his business ventures in Wild Shot Mezcal alcohol and I Love This Bar & Grill restaurants. Not to mention a constant stream of satisfied fans on the road and his Ford sponsorship. Keith made $47.5 million in 2016. A few spots down the list at No. 19, Luke Bryan netted huge returns on his Kill The Lights Tour, which continued through 2016. He also has some endorsement deals with Miller Lite and Cabela's to thank for his handsome $53 million in 2016. Kenny Chesney actually tied at No. 12/13 of the most paid musicians of 2016 with Justin Bieber. Seriously. Both had huge years with new chart-topping music and sold out tours. Chesney famously sells out football stadiums at this stage in his career, so he doesn't necessarily play as many dates. But he makes them count. He also counts his Corona endorsement deal and sales of his own Blue Chair Bay Rum towards an easy $56 million in 2016. Still the king of country when it comes to bringing in the big bucks, Garth Brooks is country music's top earner in 2016 and the No. 6 earner in all music. He made $70 million this year, thanks to his massive comeback tour (which started in 2014). Brooks also announced a streaming deal with Amazon and released a record and box set that will help keep him at the top as well roll into 2017. He made $70 million this year, and his total tour revenue since 2014 is rising in the hundreds of millions category. Wow. That's a lot of dough. And if you couldn't guess already, a former country hitmaker topped the list. Yep, Taylor Swift came in at No. 1 again with a downright stupid $170 million. As in, one hundred million more dollars than Garth Brooks. Though not a country star, Jimmy Buffett also showed up on the list. He's known for influencing some modern country hitmakers. Kenny Chesney and Zac Brown Band sing their Buffetf-inspired castaway tunes at every concert. He came in at No. 27 with $40.5 million. Buffett's entrepreneurial approach to his brand inspired a lot of these current breadwinners to do things like open up restaurants and launch product lines. So yeah, 2016 sucked for music as a whole, but it wasn't too bad for these most paid musicians, to say the least. See the full list here.